The RehabCenter at Summerlin Hospital Medical Center uses an interdisciplinary team approach. This approach emphasizes continuous interaction among the team members, including weekly team meetings and patient/family conferences with the team as needed during each patient's stay. Patients receive a maximum of three hours of therapy, six or seven days per week. Prior to discharge, therapists work with family members to teach them how to best care for the patient at home. 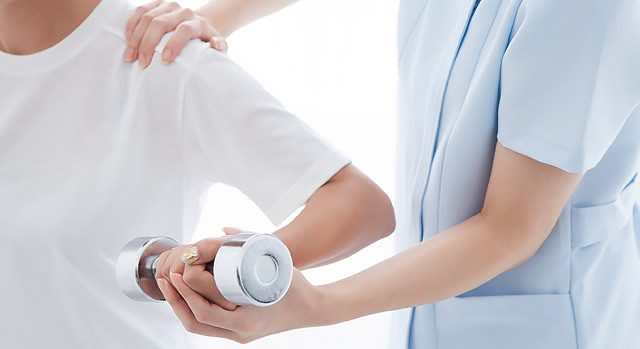 Disciplines involved in the process include rehabilitation nurses, physcial therapists, occupational therapists, speech and language pathologists, respiratory therapists, dieticians and other professionals. Our teams of specially trained therapists develop individualized treatment plans to help each patient achieve their rehabilitation goals. As patients continue their recovery, treatment plans are updated and modified to help ensure that patients achieve their maximum level of functional independence. Get out of bed as much as possible and attend therapy sessions. Sit in a chair for meals. The more the patient is out of bed, the more strength they will regain. Get dressed and participate in rehab. The goal is for patients to do the same activities they will do at home after discharge, including dressing, bathing, cooking and shopping. Participate fully in therapy. It's important to be ready for each activity based on a daily schedule. Communicate with the rehabilitation team, especially about the recovery goals and level of pain. Stay active on weekends to continue to build strength, endurance and stamina. The Summerlin Hospital rehab units feature therapy gyms with advanced equipment to help patients regain their strength, mobility and function. For more information about The RehabCenter, call 702-233-7270.